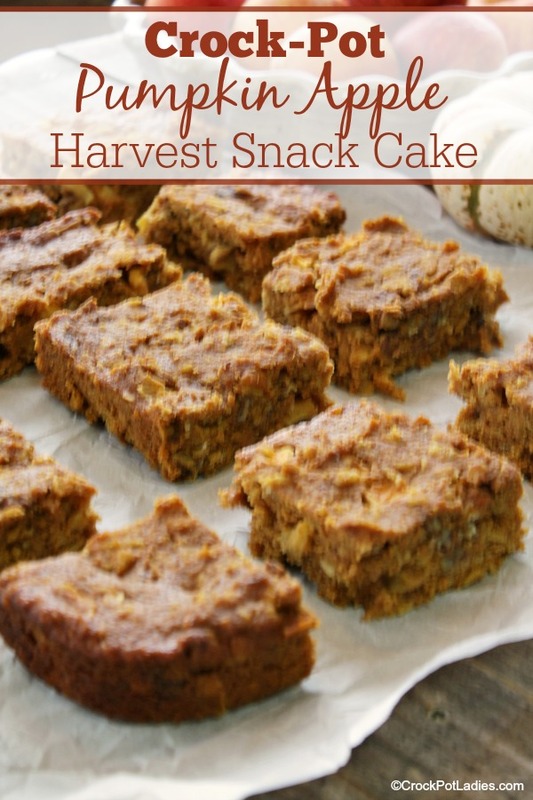 This lovely recipe was inspired when I spotted canned pumpkin on sale at the grocery store as it usually is this time of year right before Thanksgiving. At just $1.00 per can I could not resist picking up a few cans to have on hand for making all the yummy pumpkin things…pumpkin pie (of course), pumpkin muffins, pumpkin bread, pumpkin cookies and more. I LOVE to bake, both in the traditional sense in my oven and in my slow cooker. So the other day I decided to set about making a healthy pumpkin based snack to serve my kids after school. I pulled out my Casserole Crock-Pot and started pulling out some ingredients…a can of pumpkin, pumpkin pie spice, eggs, whole wheat flour, oats, honey, brown sugar, baking powder, apples, pecans. I decided that I would not add any added fat or oil to the cake and instead rely on the moistness from the canned pumpkin. I was worried it might come out dry, but here is the great thing about baking in your slow cooker…it is a moist cooking environment so it is pretty hard to get a dry cake. In fact you run into the opposite problem in that things can be too moist and wet. So no added fat and keep the liquids to a minimum is where I went with this recipe. I only used a single large mixing bowl, a silicone spatula and my set of measuring cups and spoons because I didn’t want to make a ton of dishes for me to clean up later. I whipped up a basic pumpkin batter and then folded in some chopped apples (I didn’t even bother peeling them), some toasted pecans (you can use walnuts or leave them off all together), and then spread the batter in my slow cooker. To prevent the water that condenses on the lid of the slow cooker from dripping on my cake I placed a layer of paper towels between the lid and the crock. Turned the crock onto HIGH and set the timer for 3 hours. I went about my day and then checked the cake to see how it was. I poked it with a BBQ skewer because I couldn’t find the toothpicks…the kids had been playing a math game with them the day before…and it wasn’t quite done. So I let it cook for another 30 minutes and it was perfect. I let it cool completely (although I was greatly tempted to take a slice while it was warm because it smelled SO good) and when the kids came home we all enjoyed a slice. This cake is not big and fluffy…it is more dense and hearty. If I had to describe the texture it would be that of something between a pumpkin bread and a pumpkin cookie. And moist…the apples, pumpkin and honey all lend to a nice moist cake. And between you and I, the cake tastes even better at 4:00 AM before the kids are up with a cup of coffee. 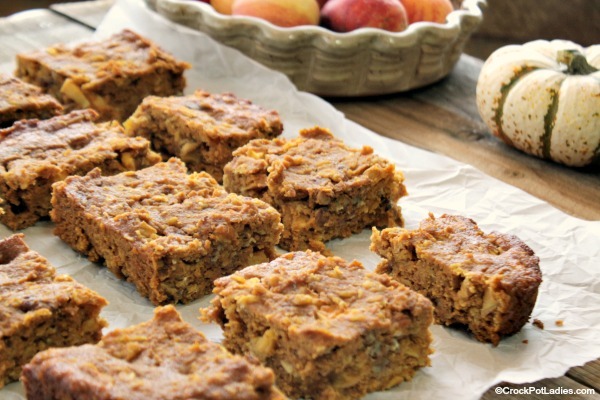 This healthy snack cake has no added fat or oil and is full of great autumn pumpkin flavor. Feel free to add nuts (or not), dried cranberries or raisins or even chocolate chips to change the recipe up. In a large mixing bowl mix together the pumpkin, honey, brown sugar and eggs by hand with a silicone spatula or wooden spoon. Add the flour, oats, baking powder, pumpkin pie spice and salt and mix very well by hand. Fold in chopped apples and up to 1 cup of optional ingredients such as toasted and chopped walnuts or pecans, dried cranberries, raisins or chocolate chips. Spread batter evenly into lightly oiled 3.5 quart casserole Crock-Pot. 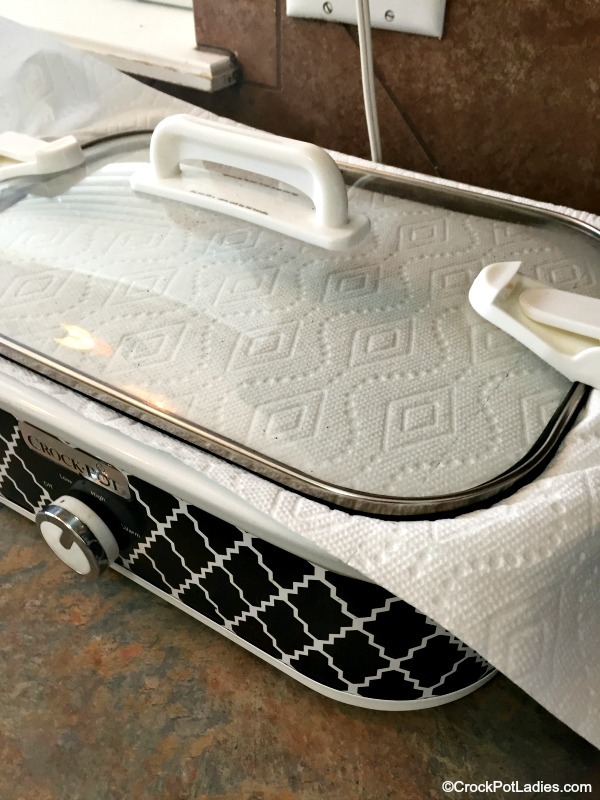 Place the lid on the slow cooker with a single layer of paper towels (or a clean flour sack type kitchen towel) between the lid and the slow cooker. Cook on HIGH for 3 to 4 hours or until a toothpick inserted in the middle of the cake comes out clean. Let cake cool completely uncovered before serving. Please note…I have not tested this recipe using other types of flours for those of you with wheat or gluten sensitivities. Nor have I tested this recipe with other types of sweeteners. If you want to experiment using alternate ingredients please come back and let us know how it worked out for you and what ingredients you used so that other members of the Crock-Pot Ladies Community can learn from your cooking experiment! Just made this tonight. We love it! Gluten free so used 1/2 c nut flour blend and 1/2 c rice flour. Delicious! I am so glad you enjoyed this recipe Stephanie and it is great to know that you were able to make it gluten-free too! 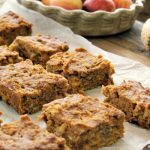 I have been making this snack cake every couple of weeks now, my family loves it as a quick and easy snack or breakfast on the go!